Trump can order the Pentagon to create a Space Force but only Congress can make it happen. WASHINGTON — President Trump on Monday threw a wrench into the Pentagon’s carefully laid out plans to analyze how best to reorganize the military’s space forces. 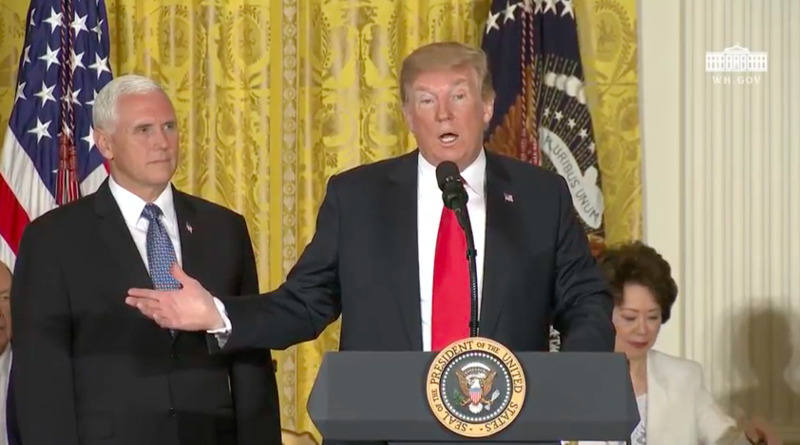 In remarks kicking off a meeting of the National Space Council, Trump pointedly directed the Pentagon to create a Space Force as a “separate but equal” branch of the U.S. military. According to sources, Trump’s remarks were not off-the-cuff. He had planned to make this announcement weeks ago, and Pentagon officials had been advised the president would be directing the creation of a Space Force at the June 18 National Space Council meeting. Trump mentioned his desire to have a Space Force at four different events in recent months, and the feedback he received was mostly positive, which motivated him to get the process started sooner rather than later. So what comes next? Congress has to rewrite Title 10 of the United States Code that outlines the roles and missions of the armed forces. “The president proposes, but Congress disposes,” pointed out Doug Loverro, former deputy assistant secretary of defense for space policy. Loverro is an adviser to congressional committees and has been a proponent of a separate military service for space. “Only Congress can organize the military,” Loverro told SpaceNews. The National Defense Authorization Act of 1947 created the Air Force. The Air Force today oversees about 90 percent of the military’s space funding, programs and personnel. Conceivably the 2019 NDAA that is now going through the legislative cycle could create the Space Force, Loverro said, although Congress would have to give the Defense Department at least one or two years to execute such a large reorganization. At the White House on Monday, Trump talked about the Space Force in the context of his broader concerns about the United States’ dominance in space being challenged by China and Russia. The president’s directive sets the stage for a contentious debate as the House and Senate prepare to hash out a final version of the 2019 NDAA. The House almost certainly will be enthused by the presidential push for a Space Force. In the past two years it has led efforts to create a Space Corps, but the legislation was opposed by the Senate and by the Pentagon.